Hi all! This is Jim B. with ESRI Support Services. Today, I have a few tips to share that will help you get to the resources that you need. As many of you may have noticed, the ArcGIS Desktop Help, available at http://resources.arcgis.com, has gone through a few changes recently. These are all meant to help us all find the answers we need as quickly as possible. But wait! I can’t find the resources for the ArcGIS Desktop Help for 9.2, 9.3, or 9.3.1! Never fear, there is a quick and easy way to get back to the ArcGIS Desktop Help that was created for versions previous to ArcGIS 10. These legacy resources can be found at the following link: http://resources.arcgis.com/content/web-based-help. Here, you will be able to find Desktop Help for ArcGIS versions 9.1 to 10. The easiest way to get to the documentation is to select the version you have and then search on that page for the documents that you want. Voila! It’s the best of both worlds, old and new, helping us use ArcGIS to its fullest potential. Logging Support Requests - What's New? Hi, this is Melissa from ESRI Support Services. I wanted to provide you with some updates regarding different avenues to get in touch with us when you’re experiencing a technical issue or question. The two underlying methods of phone vs. email still exist, but with the new look and feel of the Support site, there are two new areas that you’ll visit when trying to get in touch with us on the main landing page. They are titled ‘New Support Requests’ and ‘Contact Tech Support’. 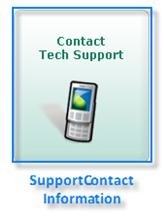 If you’re looking for our email address or phone number to call us directly, you can go to ‘Contact Tech Support’. 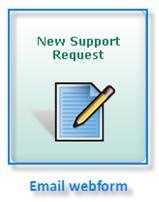 If you want to log an email webform with your problem description, screen captures, and attachments, the ‘New Support Request’ link is the place to click. Within the email webform, there are a lot of features that help tell us about the issue you are encountering. These were described in a previous blog: ‘Announcing New Features on the ESRI Support Request Web Form’. Within the form there is also a section where you can include attachments up to 70 MB in size with the following file types (*.jpg. *.jpeg, *.gif, *.png, *.pdf, *.doc, *.rtf, *.txt, *.zip, *.docx). There have been many changes to the email webform to enhance functionality and ease of usability for users. One of the most recent updates is an increase in the character limit within the description entry section of the New Support Request form that allows for up to 5000 characters. This increase was implemented based on feedback received regarding the previous 2000 character limit, so keep your suggestions coming. Use whichever method you feel most comfortable with to contact ESRI Support Services, and we hope to hear from you soon! Why not add a version filter to the search? It is cumbersome to do two searches: one for 9.3.1 help , and another for all other resources.